Update2: Codeplex issue is now closed and I am very optimistic that we've fixed it this time as I have a working build right now. We are very close with the recent changes in the Framework, but UDP Broadcast is still not working. Please vote so we can get this resolved before .NET Microframework 4.2 gets released! I just Tested RC1 and receiving UDP Broadcasts (needed by NetBios) still doesn't work. I wrote my own simplified test to just listen for UDP Broadcasts. 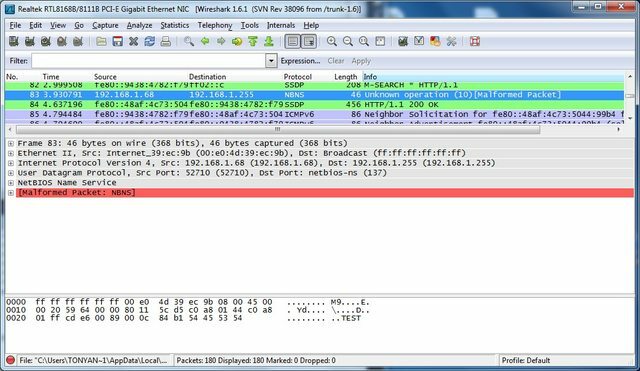 Below is a link to a video that shows the Netbios messages in Wireshark and the test code that shows how the Emulator works and the NetduinoPlus does not. A few things to notice in the video, the Netduino network lights flash showing that it is getting the Netbios messages. Also, you can see in Wireshark that the browser is emitting the Netbios name broadcasts. Netduino just seems to ignore them. But, if you send a directed message to the N+, it works (not shown). So Listening for UDP messages from a specific IP works, but Listening for UDP Broadcast messages is received and ignored by the firmware. Also, if you look in Wireshark, there are LLMNR (Link-Local Multicast Name Resolution) messages sent along-side the Netbios messages which might also allow for name resolution, but I don't believe UDP Multicast is supported in .NET MF. There are bits and pieces of multicast support in the API, but no obvious way to make it work. Can you send brodcast packets from the Netduino now? No, Broadcast is not working either, as compared to the Emulator and verified with Wireshark. Here is the code that works on the Emulator, but not on N+ v4.2RC1. IPHostEntry entry = Dns.GetHostEntry("192.168.1.255"); // This the address to local broadcast for me, may be different for others. // This actually generates a Malformed Netbios response from the router, but it does demonstrate UDP Broadcast. P.S. I didn't open the original codeplex issue, so I can't reopen it. I'll open a new one soon. If anyone else is having this issue, please vote for the bug. * on recv operations, you also have to set IP_SOF_BROADCAST_RECV=1. * filter on recv operations. It appears that the default values are 1 and have the effect of blocking broadcasts (aka. filtering broadcasts). I have tested this and one other change (already made by ZachLibby in 4.2) and it works. Both UDP Send and Receive. Once I can test this change in a 4.2 based firmware, I'll propose it back to as a change in codeplex. Very interesting. I thought these values were supposed to work the _other_ way (i.e. enable broadcast rather than disabling it). Hmm. Thanks for the great detective work, Valkyrie-MT. I've reproduced this too while porting the framework for xAP home automation to the N+. So lookes like the define set to 1 enables a filter that stops broadcasts. FYI broadcast tx and rx do work on the address 255.255.255.255 but not the local subnet broadcast eg 192.168.1.255. No xAP without broadcast. Vote added. What I'm not clear on is if this is an issue for the MF team or Secret Labs. Not quite worked out where that division of responsibility falls. After further review I now see the problem. I am using DHCP which automatically sets the broadcast filter option (SOF_BROADCAST) on the pcb. I will change the define for the broadcast filter from opt.h to 0 since there is no way to set this value from managed code for the pcb. Woo hoo! Looks like ZachLibby agrees and the settings were the problem. This means we'll likely have UDP Broadcast working in the Release!